The audiophile market is booming, and every week there appear to be new releases in all price tiers. A few years back, there were only a handful of TOTL ciems that passed the $1000 range. Now even in this price class, and well above, the competition has grown fierce. The first three years are always the hardest for a new company, and Lime Ears has spent their time in the margins waiting for a break. Their LE3 model was keeping them up float, but that real break finally came with the Aether – a new flagship that established their name, and announced they were here to stay. For even in a crowded market, the Aether has something special to offer. Emil was somewhat reluctant to give up the specs, as he feels there is so much variance between measurements that it is almost impossible to give an exact specification, that can be directly compared to other ciems. But I can attest to his ‘specifications’: the Aether is relatively easy to drive, while being quite forgiving with poor recordings or quality. Its frequency range is also wide, though more so at the top end compared to the bottom. The Aether slides in easy and fits comfortably. Insertion depth is about average, and overall there’s nothing out of the ordinary worth mentioning. Emil and I discussed some options, and after that I gave him carte blanche for the design. 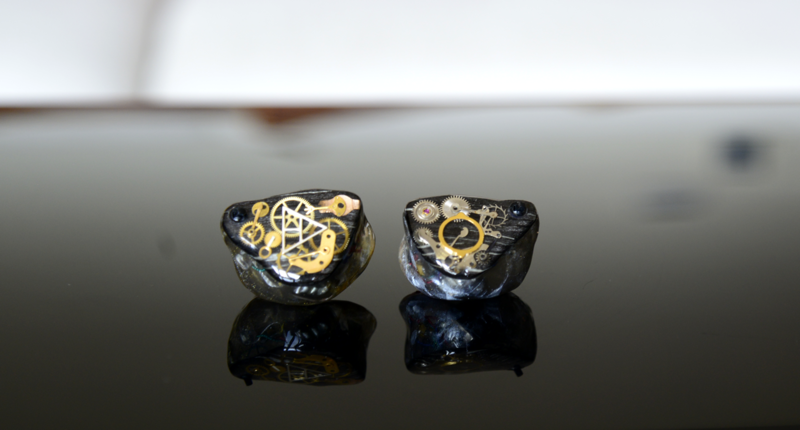 The Lime Ears monitors were the first iems I saw with the ‘time machine’ design, a steam punk style collection of sprockets. I like if the design is in line with the house style, something fairly unique to the company, so the visual design resembles the signature in some way. So I’m glad with the golden elements set against a black wood background. 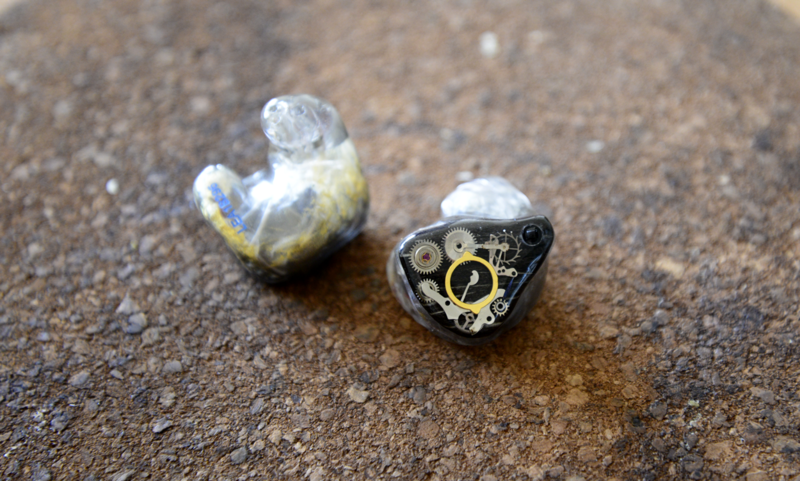 The transparent gray shells are finished with a lining of gold dust in the left ear, and silver dust in the right. The Aether comes with a switch to adjust the bass response. I’ve had iems with an adjustable bass dial before, the EarSonics Velvet and AAW W500, but in both cases a screwdriver was required. While still relatively easy, it turned out to be a step too much for frequent use, so I never ended up adjusted them more than the once or twice when I first got them. So, based on prior experience I wasn’t expecting to use the one on the Aether. But the simple switch is so practical to use, I find myself playing around with it on a regular basis. Since you can flick it up or down while listening, it’s easy to adjust between songs, or just for fun or testing. I’m glad to keep this short – the Aether comes with the standard custom starter pack. A Pelican case with your name, a cleaning tool, and the cable of course if you want to count that separately. The cable is a generic OFC 3 wire common to many 2-pin iems. 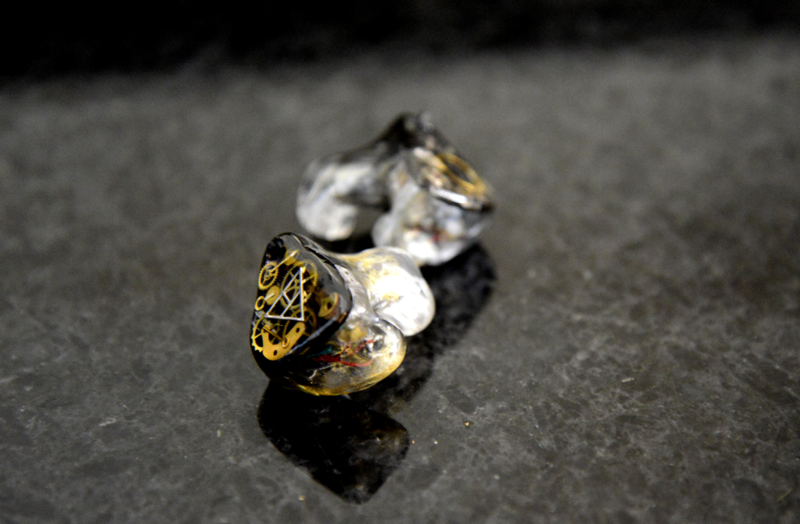 It’s the same you’ll see with iems from EarSonics, Perfect Seal, and Custom Art for instance.